This exquisite hand-crafted blank booklet is beautiful to look at when closed, and delightful to use with a favourite fountain pen or whatever you enjoy writing with. 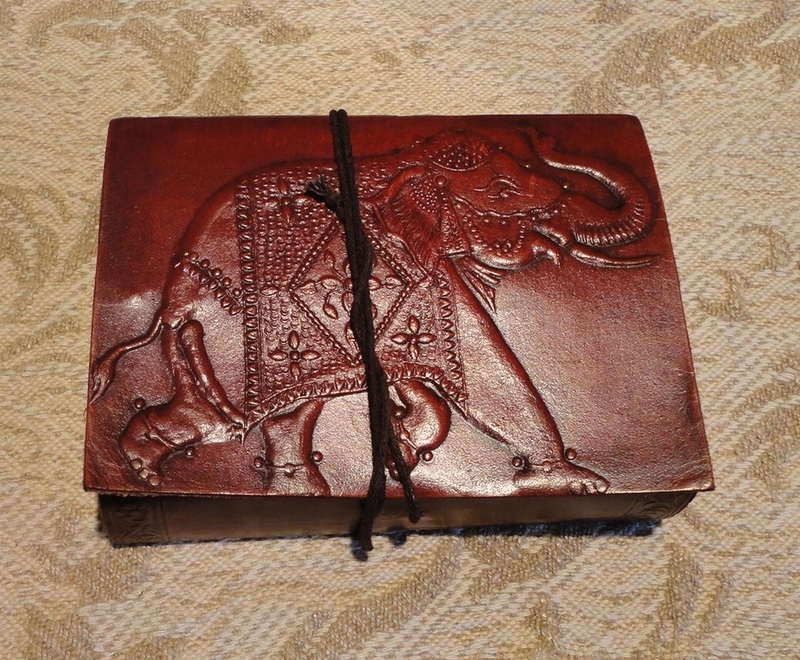 On the front cover there is a traditionally-drawn elephant, and decorative borders on the back. I liked it immediately as it brought back great memories of my Dad, who used to collect objects featuring elephants. 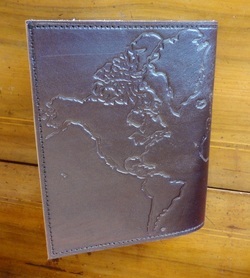 He would certainly have loved this notebook. The embossed design stands out in a glossy but earthy finish on the outside while the inner face of the leather is left rough and unsealed. The paper is hand-made out of recycled cotton scraps made into pulp, an ecological process which does not involve cutting down trees. The imperfections and bits of coloured fibre are very pleasing and organic. The sheets are tied into five bundles and cross-sewn into the spine with brown string. No glue is used, and the rough cuts and hand-made knots are visible. The overlong flap on the right can be used as a placeholder. 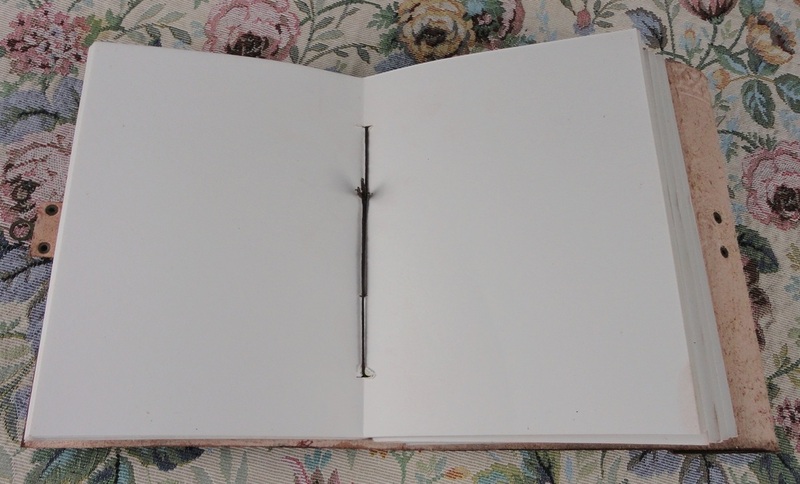 A piece of the same string encircles the book to keep it closed. 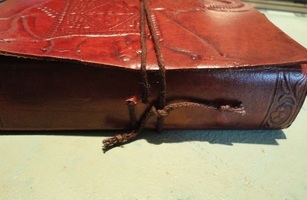 I have made a small modification so that I can tie the string with a knot (see photo). 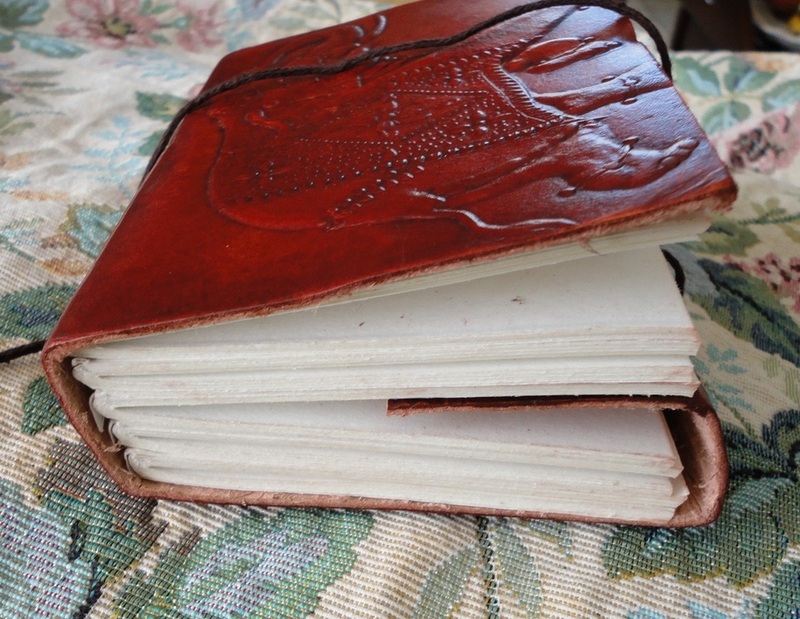 I love writing on this type of hand-made paper. The pen nib glides easily but the ink does not bleed through the page. It's also fun to sketch on it or draw with coloured pencils or watercolours. And, of course, it's perfect for practising your calligraphy. There are 180 pages but the size is really small and portable (3 ½ x 5 inches), only slightly wider than a Smartphone. I think it's a gorgeous object with lots of nostalgic appeal and a wonderfully tactile quality. 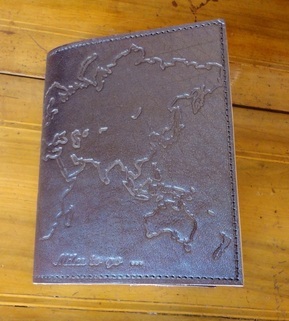 This is a rugged, hand-made notebook which would not look out of place on the ship desk of a seafaring explorer. The leather cover is thick and deeply embossed with the familiar outlines of the world continents and, on the front cover, an etched legend reads, “Miles to go ...” reinforcing the travel theme. The leather is tanned and polished to a shine on the outside, but remains rough and unfinished on the inside. My notebook is a very deep shade of brown, like dark-roasted coffee beans. 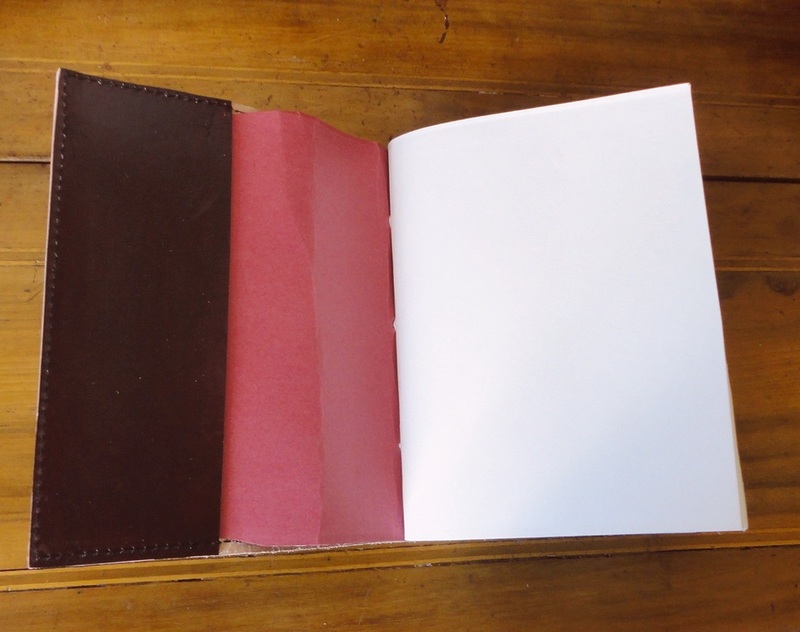 A line of sturdy stitching runs around the edges, securing two pouches on the inner faces of the covers, and providing the means to effectively refill the notebook. 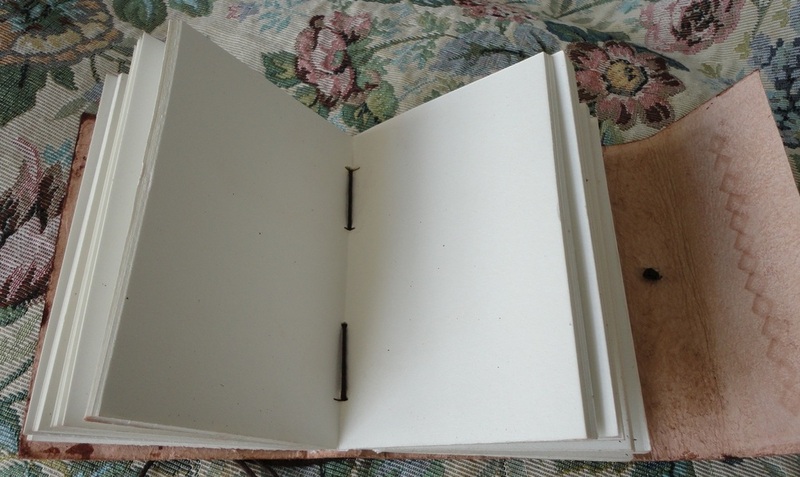 The pages are of paper beautifully hand-made by recycling old rags and discarded scraps of cotton. These ecological waste materials are then reduced to a pulp and re-fashioned into fairly thick paper, showing threads and imperfections which make this notebook uniquely tactile. 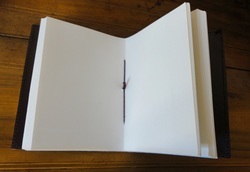 There are 100 sheets, secured by brown cord into a single bundle, making 200 pages. 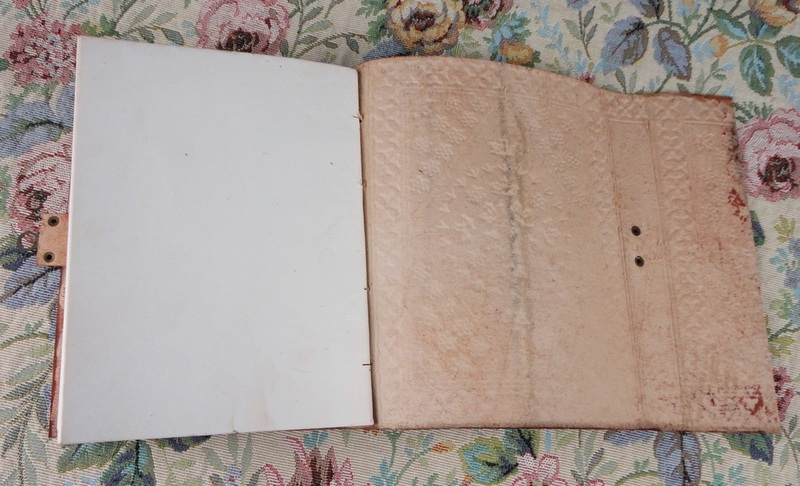 Since they are bound to a cardboard sleeve, this whole part can be removed from the leather cover. I'm not sure whether refills are available, but in any case, the pages are removable. The hand-crafted paper is a joy to write on, it's ideal for fountain pen ink, colouring pencils, sketching charcoal and any other type of writing instrument because it absorbs ink without bleeding on the reverse. It's smaller than I expected, 5.5 x 7 inches (14 x 18 cm) and while it would fit only in the biggest coat pockets, it is a good size for carrying in a knapsack or holdhall. The only criticism I would make is that it seems to have a life of its own: it wants to stay half open when closed, and when you write in it, you need to hold the pages open with your other hand. 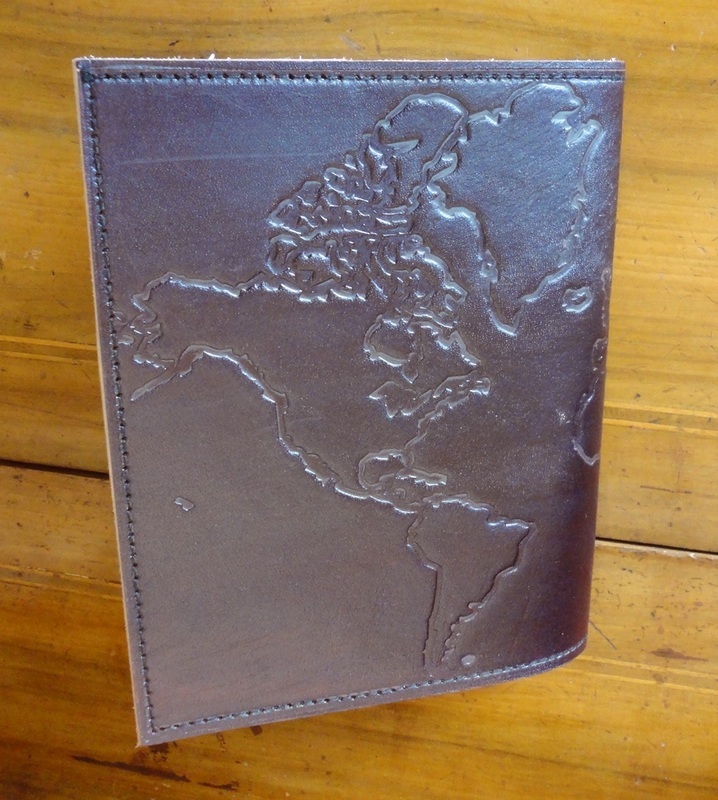 This lovely journal would make a thoughtful gift for someone embarking on a trip, as a way to record their impressions by hand. 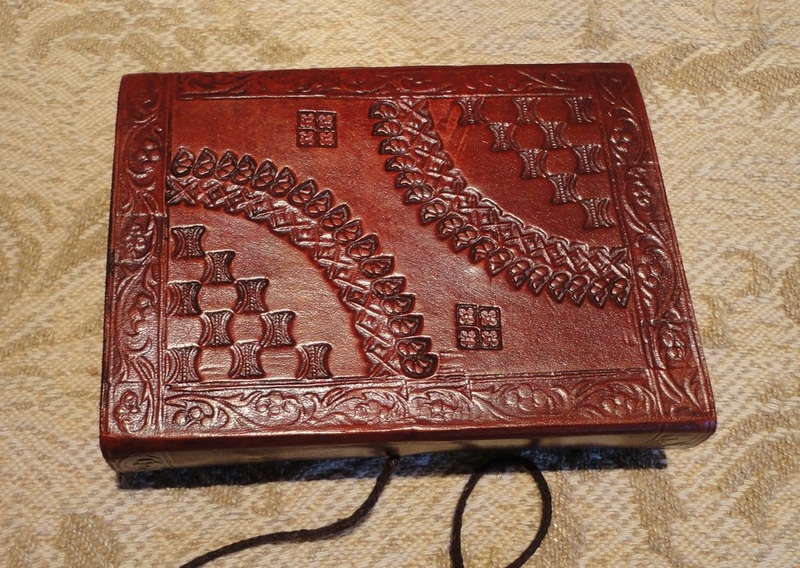 A gorgeous object to use and treasure. I received this product at no cost for evaluation and review purposes, and was blown away by its beauty. 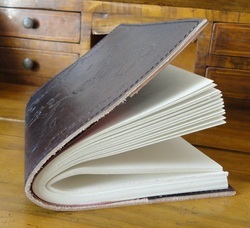 This hand-crafted blank volume is a delight to hold and to use. 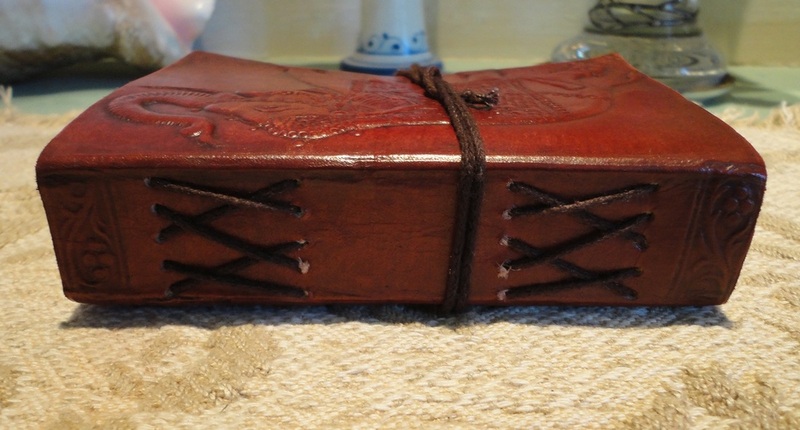 The strongly-embossed rustic leather cover releases the sort of sweet, earthy aroma that even an animal-lover like myself finds irresistible. 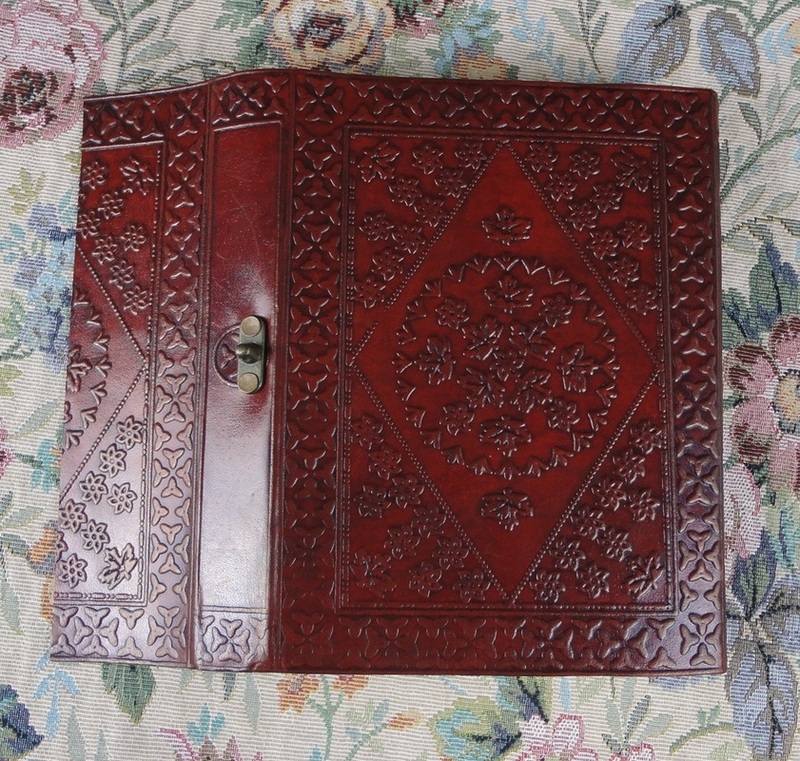 It is a tactile wonder because the outer cover is tanned and sealed to a glossy shine while the inner face retains all its rough unfinished character. 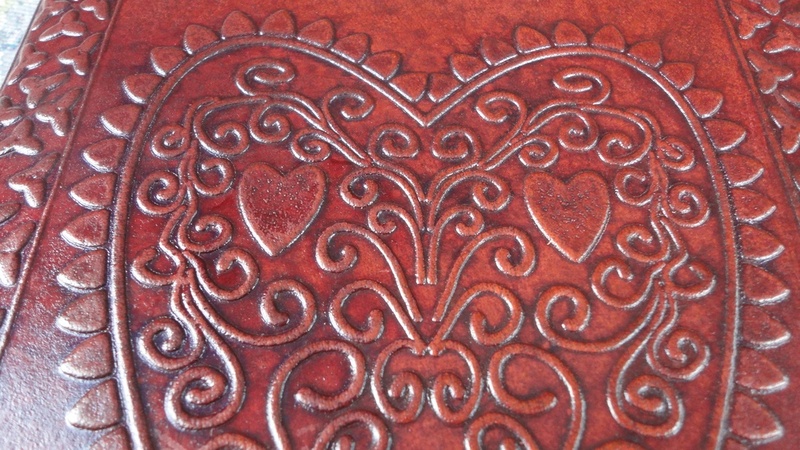 The top design is a Celtic-inspired heart extravaganza with a cloverleaf border. The underside has a more geometric motif with small flowers and leaves, both charming. It was fascinating to read about the way the paper is made without any tree impact. This paper is hand-made in what seems to me a beautiful example of recycling, gathering old rags and waste scraps of cotton, and fashioning the pulp into the most unique card stock I've seen outside of a museum. Each page shows coloured fibres and embedded imperfections, absolutely beautiful. 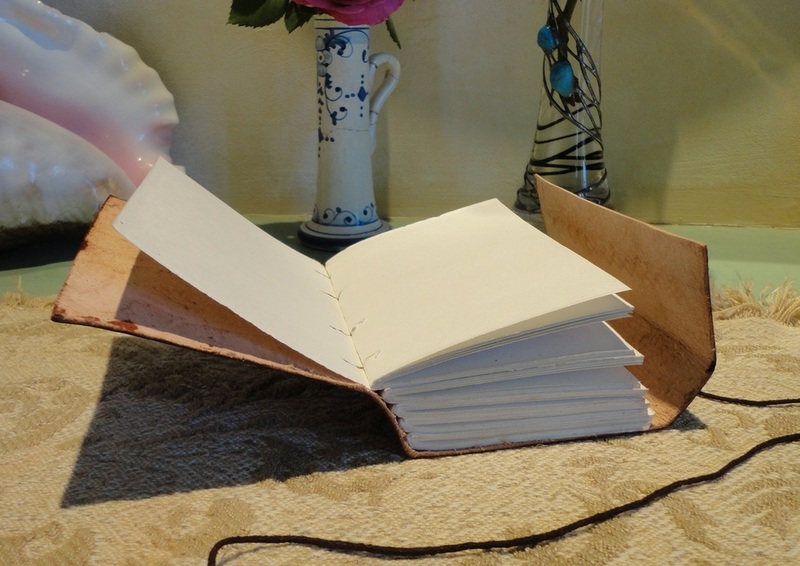 The sheets are gathered into five bundles and cross-sewn into the spine with pieces of string. No trace of glue, but the rough cuts and hand-made knots are visible. 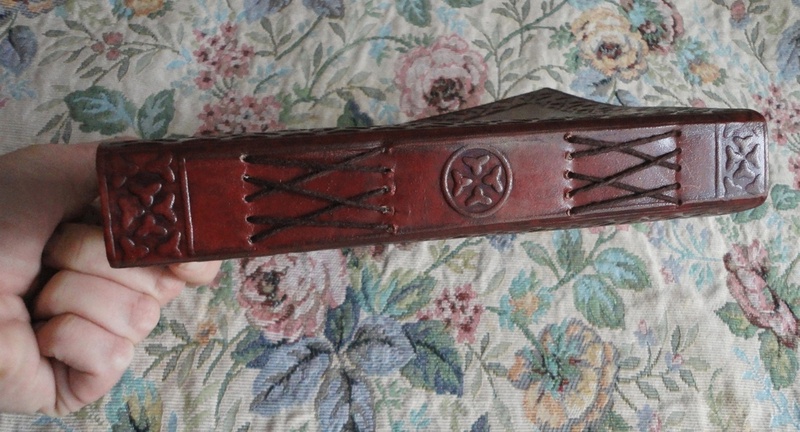 To the right of the top cover, a metal clasp interlocks with a loop secured to the bottom cover, which has a long overhang wrapping around and forming a right-hand-side spine. This locks the journal and the overhang can be used as a placeholder, but I find that to properly secure the metal closure, this flap needs to be on top. 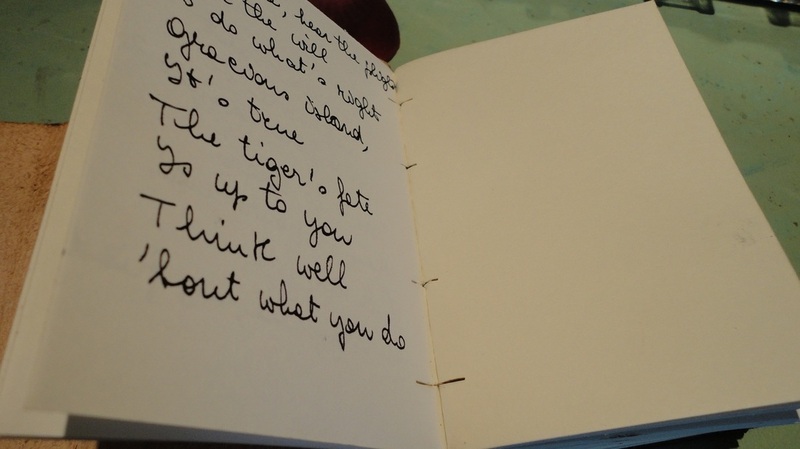 I have just ordered a calligraphy set and can't wait to write on these pages with my new nibs and inks, but in the meantime I have used a thick-tipped calligraphy felt pen and one of my ancient fountain pens to test the paper. 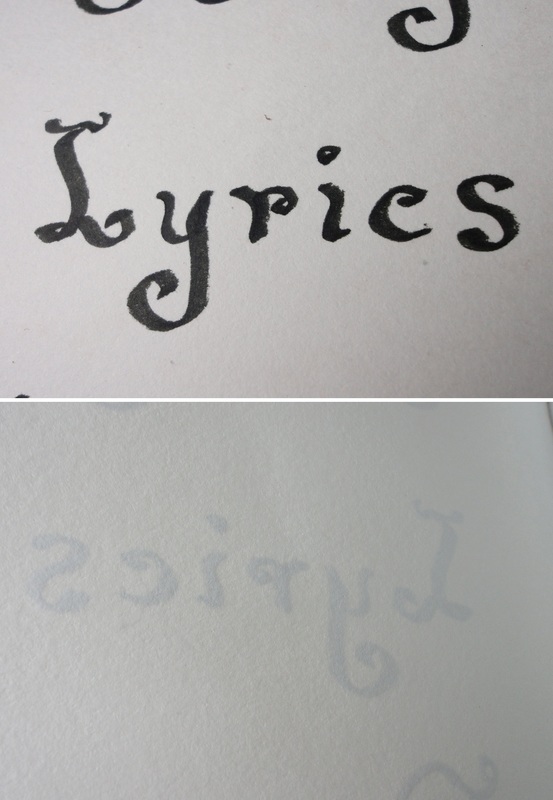 The ink flows easily and penetrates, drying quickly, but does not smear the underside (see photos). The paper is also perfect for pencil drawing and sketching, in fact, for any graphic endeavour, whether practising your best penmanship or letting the inner artist loose on this most inspiring of surfaces. I don't usually wax lyrical about consumer goods, but this journal brings out the nostalgic in me. 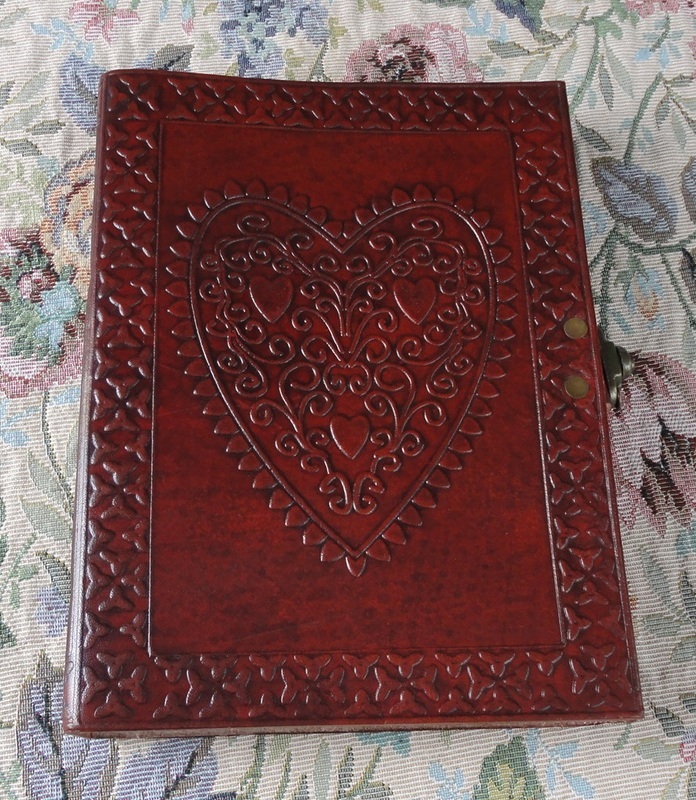 If you enjoy handling real books, writing with old-fashioned fountain or calligraphy pens, or simply holding something lovingly hand-crafted, you will be delighted with this gorgeous journal.